The 9mm Parabellum cartridge was developed in 1902 by DWM firearms designer Georg Luger. Luger created it to be used as a service cartridge for the DWM Luger semi-automatic pistol. Luger’s invention was an improvement over previous handgun ammo which was bulky and heavy. The 9mm was compact, lightweight and accurate due to its small size. The 9mm holds the distinction of being the cartridge of choice for the first submachine guns. WWI soldiers favored the cartridge for its ability to penetrate field gear. WWII reinforced the popularity of the 9mm. Soon, police, military, and civilian entities started using the cartridge for law enforcement as well as self-defense. Today the 9mm remains the most popular handgun cartridge in the world. Over 60% of law enforcement agencies worldwide use the ammo on a regular basis. 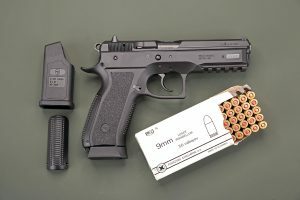 When it comes to self-defense, some naysayers point out the lack of stopping power of a 9mm compared to a .45 caliber. However, they should keep in mind that one of the reasons the 9mm cartridge is so popular is because of a lower recoil, ease of use and higher level of control. This is a particularly noticeable advantage for novice shooters. We know that seeking out the best online ammo store is quite a task, so we did it for you. When it comes to buying 9mm ammo online, we found that the best place is Ammo.com. The decision was made based on several things including great weekly ammunition sales and customer service, but also because the site is devoted to Second Amendment rights. Their goal is to arm customers physically and philosophically, educating the public on the Constitution and Second Amendment rights. Dubbed America’s Pro-Freedom Ammo Source, Ammo.com is an unwavering supporter of the right to bear arms. In fact, they are so devoted to preserving the Constitutional rights of Americans that it offers customers the opportunity for customers to choose a cause to support. Ammo.com will donate 1% of the purchase price to an organization of the customer’s choice, found on the Freedom Fighter list. Ammo Man –New Hampshire-based company that offers a large catalog with low prices. Consider ordering in bulk as the site offers free shipping on orders over $99. Ammo to Go – This Texas-based company is a powerful online seller. Fair pricing and fast turn-around times make Ammo to Go a contender. Ammunition Depot – Like Ammo.com, Ammunition Depot vehemently supports Second Amendment rights. AD carries a wide variety of ammunition, magazines, and gear. Customers report outstanding customer service. Bone Frog Gun Club –The owner of Bone Frog has extensive knowledge of ammunition and firearms. Bone Frog only sells new, American-made items and tactical gear. They do not sell reloads. Buds Gun Shop– Buds is not the largest company on the list but may have its most loyal following. Listed as a reliable, top site by customers. Offers wide selection of ammunition, frequent sales, and exceptional service. GunBuyer – Offers competitive pricing and fast turn-around times. Its easy to use system and top notch service rank high among their clients nationwide. Lucky Gunner – Lucky Gunner always seems to rank at the top of the charts for best place to buy ammo online. In addition to low prices and a live inventory count, Lucky Gunner is appreciated for its shipping cost estimator and friendly service. Outdoor Limited – This North Carolina-based site guarantees fast service and no back orders on stock. It consistently receives high marks from customers in regard to prompt and friendly customer service. RifleGear – This seller has a vast catalog of handguns, rifles, shotguns, gun parts, accessories, and gear (including high-end firearms and RifleGear exclusives). They maintain a live inventory count to eliminate back orders. Customers are also invited to visit their full-service retail stores. SGAmmo – Their website might be sluggish but the prices and service at SGAmmo get rave reviews from their customers. A family-owned and operated store, SGAmmo has a immense selection of ammo, with prices that are hard to beat. Reminder: Before buying ammunition online, know local, state and federal laws about receiving shipments via common carriers. If ammo is shipped to a restricted area, you will not receive your order and most likely lose what you paid in shipping. There may also be a restocking fee attached to the order.